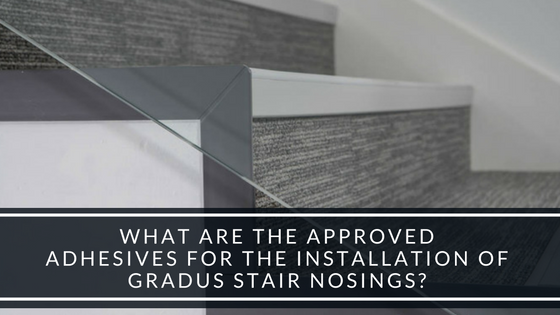 What are the Approved Adhesives for the Installation of Gradus Stair Nosings? Gradus is internationally known for its superior floor coverings and flooring accessories, and their products can take your commercial space to the next level. In order to get the most out of your Gradus solution, it’s important that it’s installed with the appropriate adhesive. When a stair nose is simply screwed into the edge of a stair, it can eventually come loose and cause a chattering effect, and installation by adhesive alone can break easily. The best installation for Gradus projects combines those two techniques - we call it the screw-and-glue method. The screw-and-glue method requires a quality construction adhesive. There are a number of manufacturers of these products, including Tom Henry’s, Silka, and Liquid Nails. We will provide the appropriate screws for the pre-drilled stair nosings based on its type and thickness. Gradus has recently released their own adhesive, called Gradus Grip, that is recommended for use with Gradus profiles. Gradus Grip is a solvent free rapid curing flexible adhesive with excellent gap filling properties that is suitable for bonding stair edgings to most solid surfaces in internal and external environments. When Gradus Grip is used, there is no need for using screws. Your finished project takes the best features of the screwing and adhesive methods, combining them to install a professional, long-term Gradus solution. What Finishes are Available for the Gradus Profiles?